Looking for business energy quotes? Fill the form and we will call you back to get a quote. Why switch your home energy with UKPower.co.uk? UK Power is an energy comparison site. We compare gas and electricity suppliers to help you find the cheapest energy prices, switch to a better deal and cut the cost of their bills! It only takes five minutes to switch to a better deal, and you could save more than £482* on your annual energy bills. Got a question? Find the answer in our quick FAQ guide. Why compare energy suppliers and tariffs? Is domestic energy different to business energy? 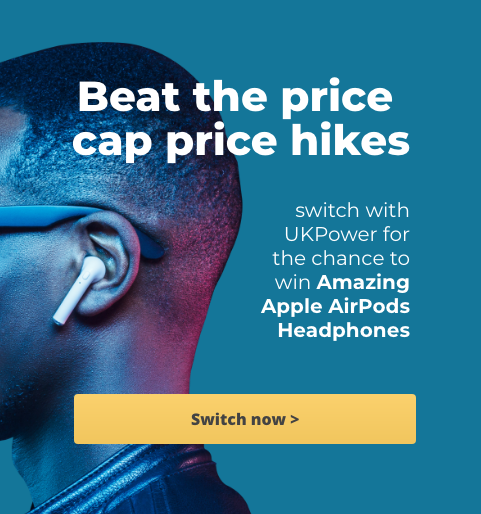 Comparing energy prices is simple with UKPower, and you can switch to a better deal on gas and electricity in the time it takes to make a cuppa. Enter your postcode and some details about your current supplier into our price comparison tool. Compare energy deals from a wide range of providers, including the Big Six and the smaller suppliers. Choose the deal that’s best for you, and let us take care of the rest. It really is that simple – we’ll let both your old and new suppliers that you’re moving, and within three weeks you’ll be switched to a cheaper rate on gas and electricity. And, as with most energy comparison sites, we won’t charge you a penny for using our electricity and gas prices comparison service, and we make our money through commission paid to us by the suppliers. You can compare gas and electricity deals, also known as dual fuel, or compare gas price and compare electricity rates separately if you prefer. And you can make the switch whether you rent or own your home. If you’re a business owner looking to save money, switching business energy is one of the simplest ways to cut costs without compromising on the quality of your goods or service. To switch to a better deal on business gas and electricity, give our switching team a call on 0800 320 2000 or leave your number here, and we’ll give you a call back. There are a number of reasons your energy bill is higher than usual, and switching supplier is just one of a number of ways to bring them back in line. You’re using more energy – It sounds obvious, but the more gas and electricity you use, the higher your bills will be. Even if you’re on a fixed rate tariff, it’s only the unit cost that is fixed, so the more energy you use, the more you’ll be charged. It’s almost inevitable your energy bills will increase during the winter, when more gas and electricity is need to light and heat your home, but it’s worth considering making a few small changes to how and when you use energy, to help cut your bills. Check out our energy saving advice guide for some ideas. Your bills are based on estimated readings – If you don’t regularly provide your energy supplier with meter readings, it’s likely your bill will be based upon estimates, meaning there’s a good chance you could be overpaying each month. You should carry out your own gas and electricity bills comparison by comparing your actual energy usage, which you can find on your energy meter, against the readings on your bills. Get in touch with your supplier to find out if you’re on estimated billing. Your fixed rate energy deal has ended – If you signed up to a fixed-rate energy deal, but never switched once this contract expired, your supplier will have automatically put you onto a standard variable tariff, which means you’ll be paying one of its most expensive rates. If this is the case, it’s time to switch supplier and bag yourself a better deal. Although bringing down the cost of your energy bills will be your number one priority, cheaper energy prices aren’t the only thing to consider. When you compare power companies and the different tariffs each offers, you should also look into things like customer service levels, opening hours, and how they handle billing enquiries. Online customer reviews are a good place to start to find out more about individual energy companies. Don’t always assume one of the Big Six energy suppliers will necessarily offer the best deal or the best customer service – there are a wide range of smaller energy suppliers out there, some of which you might never even have heard of, but they might be the best fit for you. So try to keep an open mind when running a gas and electric suppliers comparison. Every UK energy supplier is regulated by Ofgem, which means even the smallest energy suppliers must operate under the same rules as the largest. Even if your supplier goes bust, your supply won’t be cut off and Ofgem will assign a new supplier to take over your tariff. If you’re not happy with your current energy provider for any reason, from high prices to poor customer service, it’s worth running an electricity and gas suppliers comparison and making the switch. Energy prices are constantly changing, and for all kinds of reasons, including supply and demand, availability, wholesale costs, transport costs, and infrastructure maintenance. Even conflict or a natural disaster in an in oil-rich country can impact production and accessibility, which can, in turn, influence the price you pay to boil a kettle, or fire up the central heating. Wholesale cost changes are the main reason why gas and electricity prices fluctuate, and if you’re on a variable tariff, the price you pay for the energy you use will vary according to these wholesale costs, meaning your bills could go up or down. But while variable rates can drop, they’re far more likely to rise, and that’s why it often makes sense to sign up to a fixed rate tariff, and lock in your rate for a set period of time, usually 12 months. A fixed rate tariff not only offers a good way to beat the price hikes, but is also good for budgeting, as you know the rate you’ll be paying for the duration of the deal. Our electricity and gas prices comparison service is available, completely free of charge, to household and businesses alike – we want to take the hassle out of switching energy no matter what your circumstances are. But it’s worth noting that domestic energy deals differ from business energy deals, and the switching process is very different for both. Cheaper business energy – Businesses can usually negotiate cheaper energy rates than households. This is because commercial energy is bought in bulk to last the entire length of the contract, while domestic supply is bought on a monthly basis, and is affected by fluctuating prices. Business energy contracts are longer – Although some domestic energy deal can last up to two years, most fixed rate contracts are taken out over 12 months. But business energy contracts can last up to five years. No dual fuel deals – Domestic customers can usually save money on their energy bills by getting their gas and electricity from the same supplier, but these dual fuel energy deals aren’t available to business customers. To find out more ways in which business energy differs to domestic, as well as how to switch business energy, check out our guide to Business vs Domestic Energy. For more ways and reasons to contact us go here.